We are the Leading Merchandise Liquidator in the United States. Our Main Goal is for our customers to be able to make extra profit so that we can establish a long term business relationship. We buy these Liquidation Overstocks and Wholesale Closeouts direct from the stores. There is no middle man. Most of the Closeouts and Liquidations ship directly from the department store reclamation centers, directly to you. No one can cherry pick it in between. Most of the wholesale customers who purchase our Closeout Sales and Wholesale Merchandise are customers who resell in Auction Houses, Ebayers, Craigs Listers, Exporters, Brokers and Retailers. We sell our merchandise for pennies on the wholesale dollar which means that you are paying so below wholesale, that there is so much room for you to make profits. Most of our Closeout Deals and Liquidations are sold in bulk. Our bulk deals are only sold by the pallet or truckload. We have strict minimums which allow us to offer great low prices and great shipping rates. We offer a category for everyone, and make it really easy to order. We do not have any special requirements for anyone to order from us. Anyone can purchase these Closeouts and Liquidations Wholesale. Some of our categories of these Closeouts and Liquidations are: Wholesale Clothing for Men, Women and Children, Wholesale Electronics, Wholesale Housewares, General Merchandise Truckloads, Sporting Goods, Tools / Hardware, Bedding, Linens, Toys, Fashion Accessories and much more. Most of our merchandise is clean overstock and surplus unless otherwise noted. 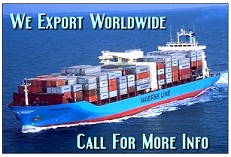 Call us any time to ask questions, get shipping quotes or to order your Wholesale Closeouts and Wholesale Liquidations. Sign up on the right to receive our Daily Deals of Pallet Sales and Truckload Deals.